Now, this is not necessarily a surprising sign. Who wants a bunch of “skate punks” messing up a good old fashioned parking lot? And no one and I do mean No Frikkin One wants to deal with the insidious character known as a solicitor, but what got me about this sign is the syntax (not the “sin tax” that is a completely different subject that will have to be chatted about at a later date). This sign seems to be addressing 3 distinct groups simultaneously. It targets skate boarders, solicitors, and their lesser known subset the skateboarding solicitors. Are skateboarding solicitors that much of an issue? I mean really. Truthfully there is probably a very good reason for the sign to be worded this way. 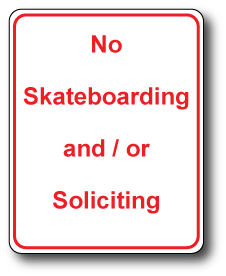 If it said “No Skateboarding and Soliciting” grammar aficionados would still be able to skate or solicit, as long as they did not do both simultaneously. 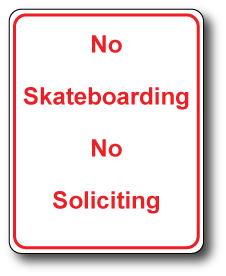 If the sign said “No Skateboarding or Soliciting” people in that parking lot might mistake soliciting as the punishment for skateboarding. It would be a really easy way for “skater punks” to get a job, and no one wants that. Damn kids need to earn their job, not have a job given to them as some sort of weird punishment. Back in my day kids would get shot with a shot gun full of salt if they were caught skateboarding where they weren’t supposed to. Not given a job in sales! There is an elegance to the simplicity of using 2 separate phrases. People really should use me as a better resource than just making transportation planning maps.